Polaroid is always a favourite amongst instant photography users. 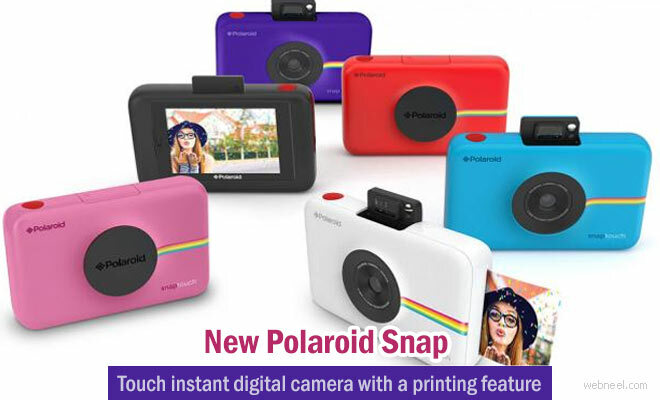 Now Digital camera users can also be thrilled with the additional features offered by the latest camera, 'Snap Touch' announced by Polaroid. Polaroid Snaptouch comes with a 3.5 inch LCD touchscreen display, which allows you to adjust the background settings after taking a picture. . Images are captured on a new and improved 13 MP CMOS sensor and the new model is capable of recording 1080p Full-HD video. Images and video footage are saved on a microSD card up to 128GB in size. This camera also comes with full-hd video capability and bluetooth features to transfer your photos to your smartphones or tablet through the Polaroid print app which is available for both IOS and Android and it's totally free. Polaroid snap touch camera uses the ZINK technology (Zero Ink printing technology) for printing out 2*3" prints within a minute. You can queue upto 10 pictures and simultaneously take pictures, which is sure to be a great hit amongst selfie users. Polaroid Snap touch is available in a variety of colors and for the pre-order it costs around $180 and the ZINK papers are available for $13 for a pack of 20.